Breakfast for dinner is a favorite in our house. 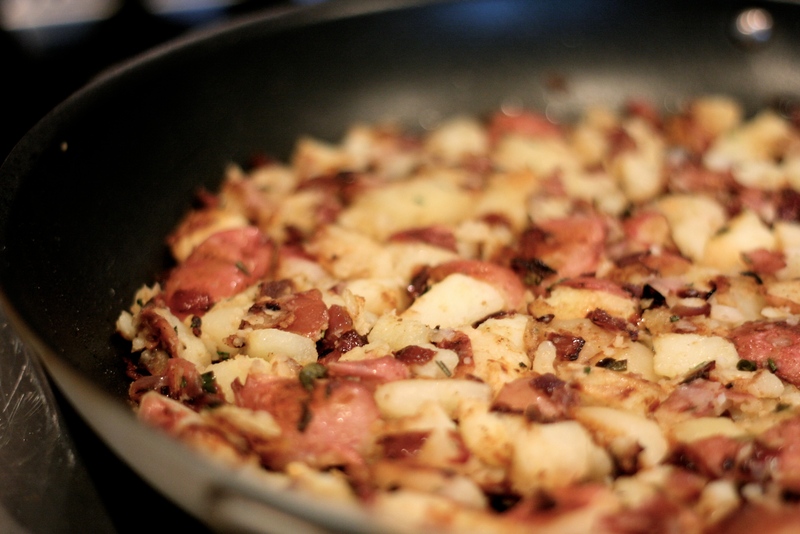 I love to make a fritatta with these home fries. Fritattas allow you to dig through your refrigerator to find those lonely peppers, herbs and any other veggies that have gone unused that week. Add a little Italian sausage and some cheese – of course, there must be cheese! Really, anything can be used to make a delicious fritatta for dinner. Instead of serving bread, I like to make these spicy home fries. I used to make them by cutting the potatoes into a small dice and cooking them until tender right in the fry pan, but I recently read that boiling them first creates even better results. I gave that method a try here and they were great. You can leave out the hot chilies if you prefer. We like things on the spicy side. 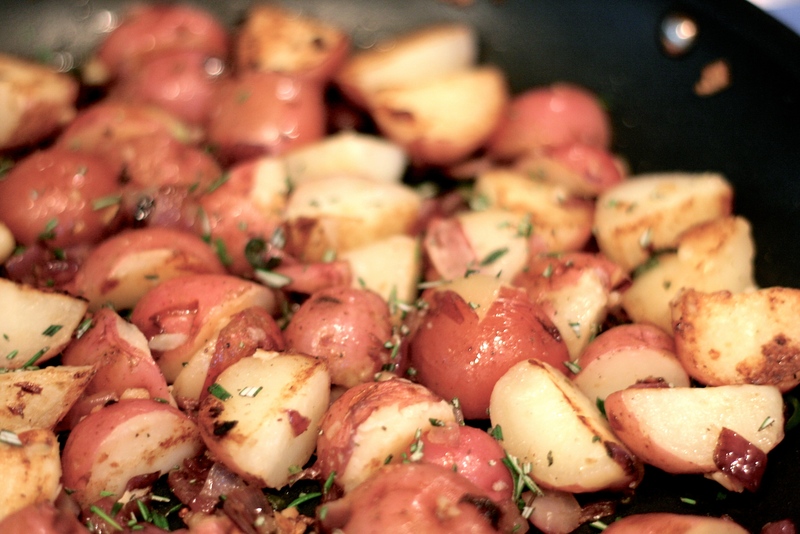 I used small red bliss potatoes for this, but you can use yukon golds or any other small waxy potato. I would steer clear of russets. I think they’re a bit too starchy for home fries. Bring a pot of water to a boil and add the potatoes. If your potatoes are small, boil them whole. Cook until tender when pierced with a fork, about 20 minutes. Drain and set aside to cool. Heat a large non-stick skillet over medium-high heat and add the olive oil. Saute the red onions and chilies until soft, about 10 minutes. Add the garlic and cook, stirring until fragrant, about 2 minutes. Halve or quarter (depending on their size) the cook potatoes and add them to the skillet. Sprinkle with salt and pepper. 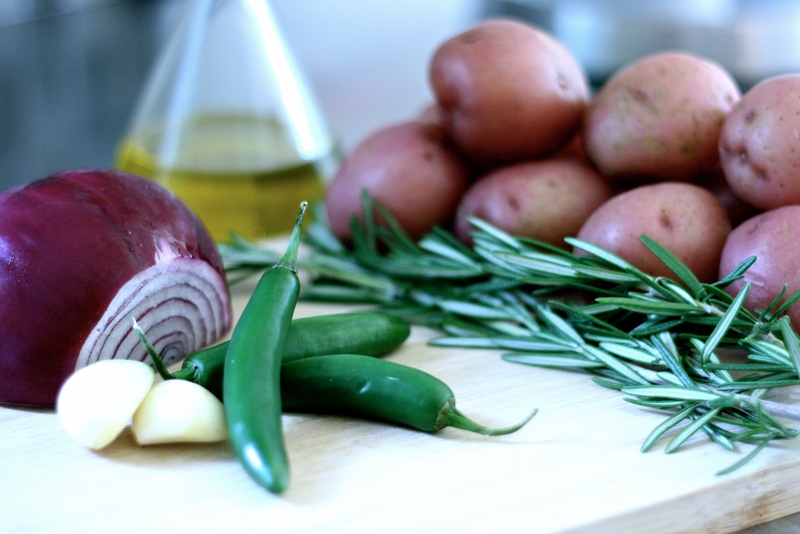 Using a spatula, mix the potatoes around with the onions and chilies so the potatoes are coated with the olive oil. Turn the heat down to medium and let the potatoes cook. Resist the urge to move them, so they can start to brown properly. After about 10 minutes, check the underside of a potato to see that they are browning. They should also get nice and soft. Using the back of a spatula, press down on each potato so they squish flat. Add the chopped rosemary and stir well. Using your spatula, press everything evenly flat in the pan and allow to cook for another 10-15 minutes. From this point, it’s a matter of opinion. We like them really crispy and golden so I stir and flatten them again, letting the potatoes continue to cook. If you prefer them less browned, remove them from the heat when they look great to you. Taste for seasoning, sprinkle with some chopped parsley and serve. 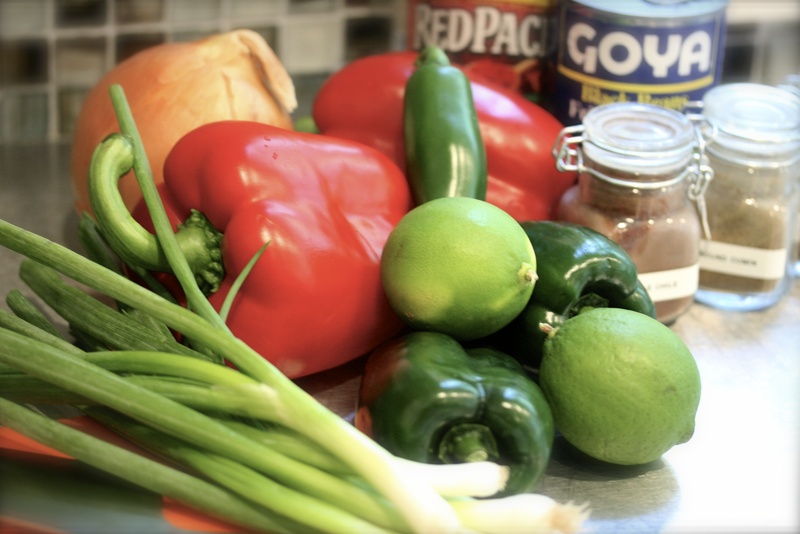 This quick Mexican side dish is perfect with fish tacos (our favorite), or even as a vegetarian dinner with rice. We seem to eat some sort of Tex Mex’ish/Mexican dinner once a week. 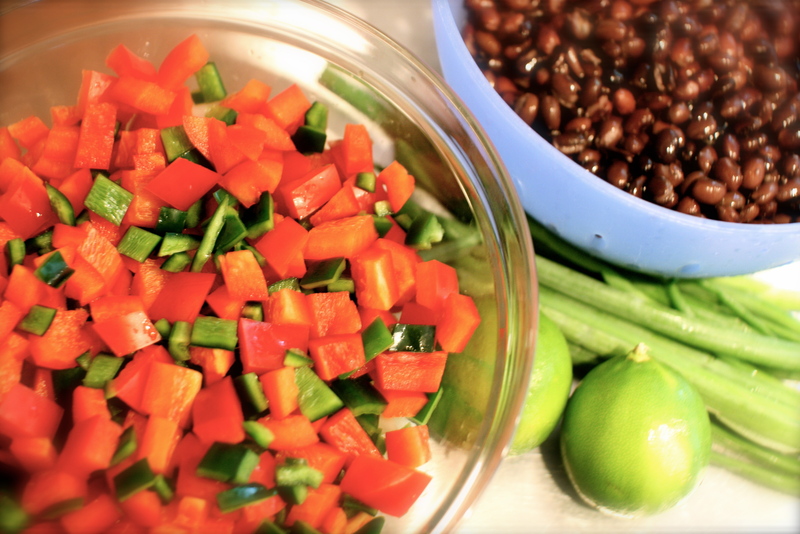 Just mash-up some avocado with fresh lime juice, grill some fish or chicken and serve these beans on the side. Voila! Or should I say Olé?! Whenever I see one of those lists called “Top 10 Super Foods” or “Foods that prevent every disease” or how about “Foods that make you look younger,” I always have to have a look. I knew legumes of all kinds were healthy and full of protein, but I didn’t realize that black beans are at the top of the bean list. According to the New York Times, black beans carry the same healthy antioxidants as red wine and other dark red fruits and vegetables. Time Magazine also includes them in their list of the healthiest foods. That’s good news, since they seem to grace our table quite often. You can make these as spicy as you like. Just be sure to remove the membrane and seeds from the poblano and jalapeño peppers, unless you want these beans super spicy. Better to serve some hot sauce on the side. By the way, this tastes even better the next day and it reheats perfectly for a healthy lunch. Heat a large sauté pan over medium heat and add the olive oil. 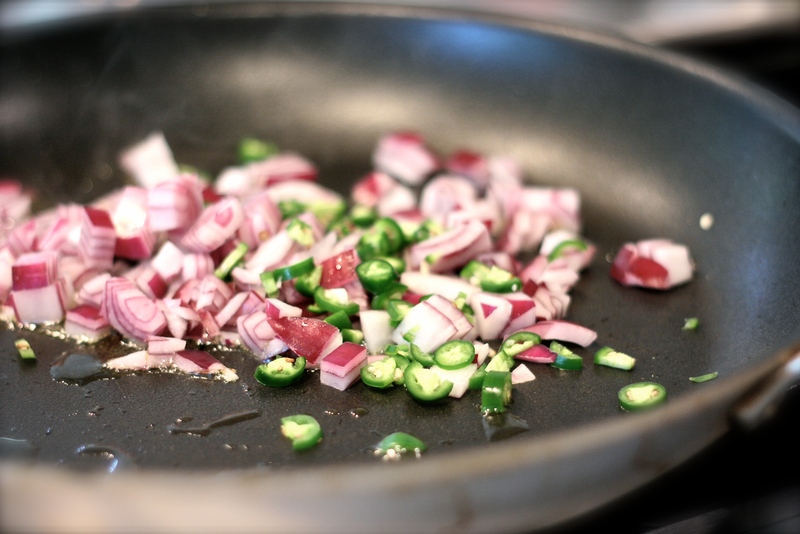 Sauté the peppers and onion until translucent, then add the garlic. 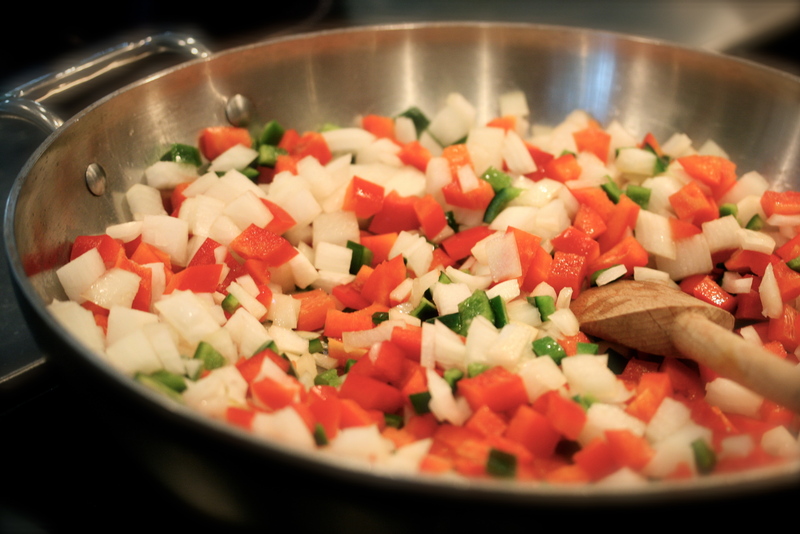 Sauté until fragrant, a minute or two, and add the diced tomatoes, oregano, chili powder, cumin, salt and pepper. Stir. Add the black beans, juice of one half the lime and the chicken stock. Stir together and simmer on low heat for about 30 minutes. If the beans get too thick, add a little more chicken stock. They should be slightly saucy. Before serving, stir in the juice of the remaining half of the lime and top with the chopped cilantro and scallion greens. This is delicious served as a side alone or over steamed rice. Brown rice is my favorite. Don’t forget to offer some hot sauce on the side and I love extra lime wedges. 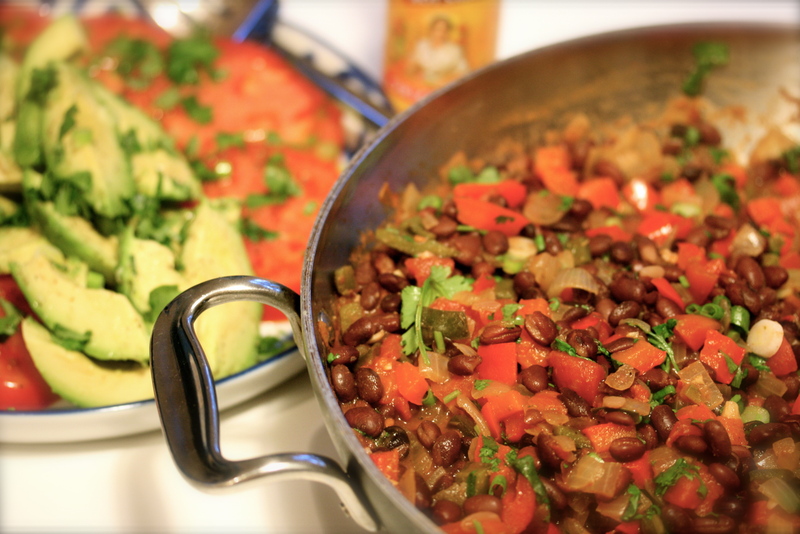 The added fresh lime juice really brightens up the flavors of the spicy peppers and beans.